Sponsor: We are going to need to slow down our spending on the project until the end of the quarter. Project Manager: How can this be? Our budget is already approved by the Steering Committee. Sponsor: I understand, but the company is struggling to hit it quarterly financial goals, and I have been asked to contribute to the cost saving required to achieve these goals by delaying spending on our project. Project Manager: You realize that continuing to stop and start activities on our project has an adverse effect on the overall timeline and effort / budget? In addition, it makes it difficult to maintain continuity from a resource perspective when we continue to implement actions of this nature. Project Sponsor: I understand, but this decision is out of my hands. Help me understand the impact on the project, and I will communicate it when I present the proposed spending delays to my manager. This post describes certain aspects of the project budgeting process that help the project manager work through project funding related events. The development of a project budget represents a “build up” costs from the lowest level activities planned in the project schedule to the point that a project is fully funded within the organization’s cost budgeting processes. The diagram below provides a depiction of the cost build up process. Activity Costs: Represents the cost associated with specific activities in the project schedule. For labor related activities the activity cost is derived from the activity hours times the labor rate for resources assigned to the activity. For material related activities the activity cost represents the material cost assigned to the activity (e.g., purchase of software, infrastructure). Work Package Costs: Costs associated with a work package represents the roll-up of the activity costs for a specific deliverable. Generally this cost can be viewed in the project schedule in the form of a summary task for the deliverable (work package). Control Account: A control account is another name for cost categories that are reported on in the project budget. Control accounts are generally either types of costs (internal labor, external labor, software, infrastructure), or costs associated with major work efforts (project phases or work streams). Control accounts are also where the breakdown between capital and expense amounts are captured. Control account amounts are reflected in the project budget summary, and are derived from the sources for labor and non-labor costs (see previous slides). Project Estimate: Represents the sum of the Control Account amounts (without the project contingency, unless the contingency is included in a control account). Contingency Reserve: Represents the project budget reserve required to mitigate known project risks. Generally the contingency is derived as a percent (%) of specific control accounts or work packages with the associated risk. The best practice is to report contingency as an explicit number either separated on the budget summary, or as a separate control account. Cost Baseline: Represents the total project budget, including the project contingency reserve. This is the amount that the project manager reports against throughout the project life cycle. Management Reserve: Represents the amount that is included in the project funding to account for unknown risks. The management reserve is reflected in capital plans and/or departmental budgets. Cost Budget (Project Funding): Represents the total amount funded for the project, including management reserves. This is the amount that the departmental budget managers are reporting against throughout the financial reporting lifecycle (with input from the project manager). This is also the amount that is reduced when the organization needs to impact the amount spent on a project during a specific time period. The concept of capital vs. expense related costs is another important area that has a direct impact on project budgets and funding. Under American Institute of Certified Public Accountants (AICPA) Statement of Position (SOP) 98-1 companies are able to capitalize the costs associated with developing or purchasing software designated for internal use. Capitalization allows organizations to defer certain costs related to the software development effort to be amortized over future periods. Expense related costs must be reported in the period in which the costs are incurred. Only certain cost types may be capitalized, and only during particular stages of the internal software project. Expense related project costs are scrutinized much more frequently and closely than capital costs because they impact the current financial reporting period (vs. future periods). As a project manager, it is important to understand the organization’s specific policies and procedures associated with SOP 98-1. These policies define how costs are categorized as capital vs. expense within the project budget. These policies also outline how the project manager must capture and report capital vs. expense project costs throughout the project life cycle. The chart below depicts the breakdown of capital vs. expense costs within the project budget. Although as the project manager, you will likely have limited responsibility for project funding, it is important to reconcile the funding model (cost budget) to the cost baseline for the project. This process starts by understanding when your project is approved by the sponsor team whether or not it is fully funded. Fully funded refers to the fact that the project is accounted for in Departmental Budgets (Expense budget) and/or Capital Plans (Capital budget). Does the underfunding situation require specific activities to be delayed? Can funds be pulled forward (spent in an earlier time period) to resolve the underfunding? The chart above provides a depiction of the comparison of project funding (cost budget) to the cost baseline. By the end of the planning phase, the project baseline is established and approved by the project sponsor and project core team. Project scope, schedule, and cost are all part of the project baseline plan. A change represents a permanent deviation from this baseline plan. The term ‘permanent’ is important. It is possible that there is a deviation from the baseline plan that will be self-correcting and is really only a deviation due to timing (when something has occurred vs. when it was planned to occur). Example of a timing deviation: A deliverable that was completed a week late because the sequence was switched with another deliverable. Example of a permanent deviation: A deliverable that was completed a week late, because it took a week longer than anticipated to be completed (and that week cannot be recovered). Scope – Additions/reductions in scope can be either in terms of scope of the product or project – in both cases they change the deliverables articulated in the WBS. Schedule – Planned timing of activities and/or deliverables. In most cases, changes to the schedule are only identified / managed if they impact the project end date or a major milestone. There is not one standard definition of a change. Change must be articulated in the context of the specifics of the project. It is important to distinguish between a change and a clarification of expectations. Only changes that have material impacts to the baseline plan will be formalized and managed (the Project Management Plan defines materiality). How the change is determined to be a permanent or timing project impact. Customer Needs / Requirements – Adding a product requirement is a common source of change. Adding or changing a product requirement during the middle of development / build / test activities can have even more impacts because of re-work and impacts to other parts of the product. Often the change represents more of a clarification of the original requirement, and not a change in the intent of the requirement. The clarification could still represent more or less work to be completed to satisfy the product requirement. Implementation of new technology introduces a certain amount of risk / unknowns. During project execution these unknowns may introduce real changes in the work required to complete the implementation (e.g., hardware procurement and set-up, software configuration & customization). An organization’s standard technology platforms may change. If the work required to comply with the new standards is not reflected in the plan, it often represents a change to the project. Planned vs. Actual Execution – The most common source of change is simply that work is completed in a different manner than originally estimated and planned. The following are more specific examples of this source of change. Inaccurate estimates – Activities take more or less time than was estimated. This is more likely to occur if this type of work had not been done previously by the company or by the resources providing estimates. Change in resources – The skill set associated with the resource completing the work is different that the skill set the estimates were based upon. Changes in resources in the middle of the project introduce factors like ramp-up time, the skill level of the new resource, availability of the new resource, the billing rate of the new resource. Change in deliverables / activities – The addition of or removal of deliverables from the WBS can impact timelines, costs, and quality (e.g. adding training materials). Also, there could just be a process / methodology change that requires new tasks or a change to a task even though there is not a new deliverable. For example, if quality standards change, that could increase the time it takes to perform some tasks. Sequence of work completed (project dependencies) – New or different project dependencies are identified during the project execution that could permanent delays in subsequent activities / milestones. In addition to understanding the potential sources of change for your project, it is also important to understand and monitor key project metrics that help identify potential (or real changes) early on (early warning signs). It is fairly intuitive that the further the project is in the project life cycle the more costly and impactful the change is to the project. The overall goal of change control is to prevent changes from overwhelming a project or taking the project unnecessarily off track. The goal of change control is NOT to prevent all change. Change control enables proactive identification and management of change, in a manner that keeps the project moving in the right direction, towards successful completion/delivery. Identify Change: Either the project manager identifies, or is made aware of a change. Based upon guidelines established in the Project Management Plan (permanent vs. timing, and materiality), the project manager determines whether or not the change should be formalized and assessed. Assess the Impact: Once the change is identified and it is determined the team needs to assess the impact of the change on the project, the assessment is documented, using a change control tool (i.e., a project impact report). Review and Approval: Once information about the impacts of the change have been documented, the change should be reviewed by a Change Control Board and either approved or rejected. Implementation and Verification: Planning and execution of the actions required to implement the change. Implementation includes adjustment to planning artifacts to accurately reflect the new scope, schedule, and budget based upon approved change. Implementation of the change effectively establishes a new baseline for the project. Follow-up Verification: Perform a follow-up review to confirm that the appropriate actions were completed to implement the change (corrective actions), and that the change had the anticipated impact on the project (time, cost, scope, quality, risk). Remember that change is inevitable and oftentimes necessary. However, it is important to control change so that changes are properly assessed and only approved changes are implemented within the project. It is important to understand the cumulative impact of changes on a project with regards to the scope, schedule, and cost/ budget. Throughout the life of a project, there will be changes. The project core team, project sponsor, and steering committee members should be aware of the cumulative impact of changes (comparing actual project performance to the original expectations established in the baseline plan). The project manager is ultimately responsible for project execution against the baseline plans. The project manager should be able to explain the evolution of that plan from the original baseline to the current baseline, including all approved changes that have been implemented. Project managers often will fall back on the excuse that the project is over budget or late because there were project changes, but they cannot quickly explain the changes that account for the primary deviations from the original plan. Effective use of the change control log (see my blog post on Using SharePoint to Manage Change Requests) provides a tool to track and reconcile changes to the baseline schedule and budget. Reconciling the actual project performance (schedule & cost) to the original baseline plan helps understand the “unexplained” variances. An unexplained variance is the difference between the total schedule or cost variance and the approved project changes / impacts. A project with too high a percentage of unexplained variances is usually an indication of a project with inadequate attention to change control processes. These projects have too many changes that are “flying under the radar”. I am a not a big fan of the term “scope creep” because it represents an excuse vs. an explanation. Good projects managers can pretty precisely describe the difference between the original baseline and the actual results – strive to be a good project manager. Be proactive. The cost of implementing change increases later in the project lifecycle. Utilize project metrics to monitor trends and identify potential changes. The level of control and rigor around analyzing and approving changes should be appropriately “sized” to both the organization and the project. Project size, complexity, and risk profile are evaluated to adapt the change control processes to the project. If changes have different impacts when they are implemented (higher actual cost or schedule impact), maybe there is not enough rigor involved with the change analysis process. Projects that place more importance on schedules and/or cost constraints tend to require more control around analysis and approval processes. Another consideration associated with change control processes is the visibility / strategic importance associated with the project. Provide visibility of the change request throughout the change control process. This ensures that everyone involved with the project can easily find out the current status of any changes in the process, as well as the reasons for approving or rejecting specific changes. Focus on the making sure the change gets appropriately implemented. Project teams often spend all of their time and energy on analysis and approval, and forget to adjust project deliverables to reflect the change. Follow-up to confirm the implementation steps have been completed. Compare the actual impact on the cost and schedule to the estimated project impact. At the heart of most successful projects you will find an effective core team that is fully responsible for the day-to-day leadership of the project. This is not to be confused with the strategic level guidance that represents the key function of the project steering committee. The project manager is responsible for ensuring that the core team is effectively selected, on-boarded, and fully engaged throughout the project life cycle. What is the purpose of the core team? The practical answer is that the core team is responsible for monitoring the progress of each of the key deliverables and making decisions about course corrections should the project begin tracking behind schedule, over budget or if major scope changes occur. What are the important elements of a good core team? Diversity: Diversity is a key element of the core team, because it is critical that different perspectives about the project and the project deliverables are fairly represented on the core project leadership team. These perspectives should be represented from day one of the core team — many project managers are tempted to exclude groups from the core team until they are needed to perform specific project activities. Inclusiveness vs. effectiveness: The core team is not the entire project team working on different project activities. Sizing the core team appropriately is critical to the successful management of the project. As the project manager you need to strike a balance between including the right people in the day-to-day management of the project, and creating a team that is too big to effectively make decisions. Based upon my experience the appropriate core team size is somewhere between 6-10 people. Assessing the Organization: The type of organization you are working in significantly influences the manner in which the core team is formed (depicted in the chart below). In a functional organizational, it is generally the functional leads that represent their area/department on the core team. In a matrix and project organization, the core team is generally formed based upon the role of the people assigned to the project. 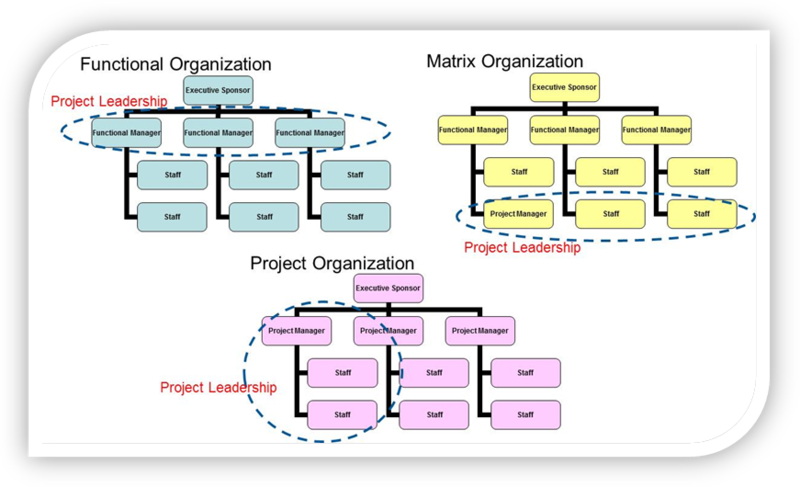 The type of organization also impacts the project manager’s role and authority on the project (from limited in a functional organization, to full control in a project organization). Determine which roles should be included on the core team. I find the most effective method is to look for the roles on the RACI chart with the most significant R’s (Responsible). Decide what project team members can fulfill these roles, If the team has not been formed, the question becomes what people in the organization can fulfill these roles. Determine if the composition of the core team needs to be adjusted based upon disconnects between the roles on the core team and the names assigned to the team. 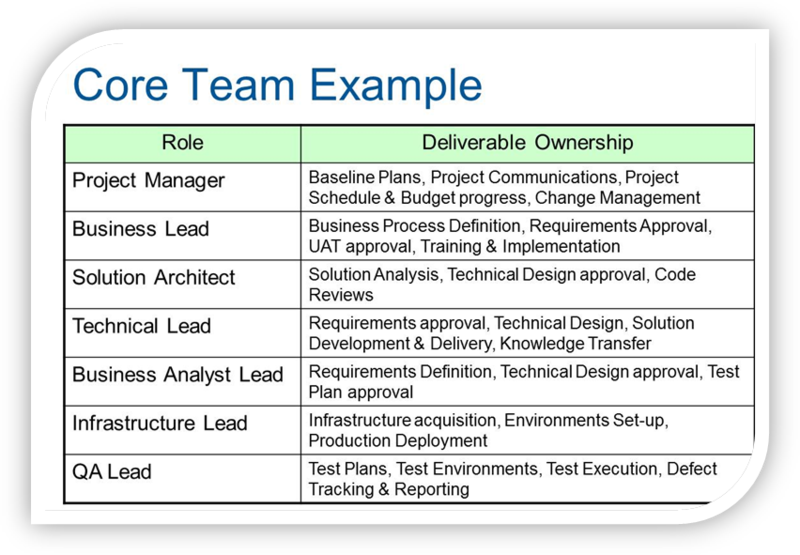 The following chart provides an example of assembling a core team, based upon ownership of the key project deliverables. Ownership does not necessarily represent the person that will complete or manage the deliverable, but rather the person that will be responsible for the deliverable. Responsible means that this is the role that will ensure that the quality, scope, timing and cost of the deliverable are satisfied based upon the expectations established in the baseline project plan. Key deliverables which do not have an explicit owner established on the core team generally represents a RED flag (project risk), because the project manager will likely be required to manage these deliverables outside of the project leadership team as a “one off” process. You will find that multiple people may be required to fulfill specific roles, if one person cannot adequately represent the full scope of the deliverable on the core team. In addition, specific roles may be filled by consultants or third party partners. Getting stakeholders, functional managers and other resource managers to agree to loan you the right resources for your core team can be a challenge. Having a solid project management plan with high level milestones and roles/responsibilities, Project Sponsor support for the initiative, and clear definition of the deliverables (in the form of a WBS) to reference during the discussion with the resource managers makes this process much easier. When assembling the core team it is important to interact with the potential core team members to understand how well they understand the project – and how they feel about the business case (benefits, scope, target dates). It is a bonus to obtain resources that are passionate about some aspect of the initiative (benefits to their organization, learning opportunities for them, team dynamics). Prior to the overall project kick-off, the core team is assembled for a planning meeting (or series of planning meetings, depending on the complexity of the project). The planning meeting helps level set the core team on project planning efforts that have been completed to date (prior to them joining the team), and launching the efforts to complete the remaining planning activities/deliverables. The Project Manager facilitates the discussion on project planning deliverables completed to-date (project charter, milestones/target dates, scope statement, RACI, and the Project Management Plan). Making sure everyone is clear about what their role on the project is one of the essential topics at this point in forming the core team. The team’s diversity in terms of backgrounds, perspectives and talents significantly improves project outcomes. Right-size the team to accomplish the task at hand – manage the day-to-day project operations. Make sure the team can adequately “own” the project deliverables, but is not too large to effectively manage team dynamics. The core team should be formed in a manner that is consistent with the organization that is driving the project. Clearly communicate with resource managers (about the project and resource needs). Use the project sponsor appropriately to gain support of the initiative. Obtain buy-in of the potential core team members (to understand their commitment to the initiative, and comfort with their role). Spend time “forming” the team. Clearly communicate the plans completed to-date. You want the core team to “own” the plans, even if they were not involved in making all of the decisions or creating all of the planning deliverables. Focus on getting immediate traction on the work ahead. Quickly align the core team with the project priorities, and ownership of next steps.